Orizzontale started from the public action of Jacopo Ammendola and Juan Lopez Cano whose aim was the reactivation of the restoration of a disused square in Largo B. Perestrello in Rome. After the realization of an underground parking in 2003, the area of Largo Perestrello remained unoccupied and none of the later governments has been able to give new value to this potentially valuable space for such a populated area. In November 2010 Orizzontale, with the participation of the neighbours, made a first attempt of pressing for a public reaction, removing the mesh fences and placing them inside the area shaping a big question mark. After this input, the municipality started to work for the creation of a new market so Orizzontale changed their initial idea in the realization of an installation to put outside of the building side, called Work-watching. Work-watching was a five-steps stair totally built with recycled materials that had the function of a sitting meeting place and of a watching point from where the inhabitants could control the works in progress. Actually, the goal that Orizzontale wanted to reach was to foster the re-appropriation from the inhabitants of a place that was completely dismissed and the creation of new dynamics of interaction in a common space. All the projects of the architecture collective aim to make citizens conscious that the places there are living in have plenty of unseen potentialities. At the beginning they worked as provokers, installing their projects by their own, waiting for a late reaction of the community for a shared experience of the new elements. In the last two years, they have developed a new building process that involves the people in the realization of the installation itself, in order to experiment new kind of interactions between city dwellers and urban commons. 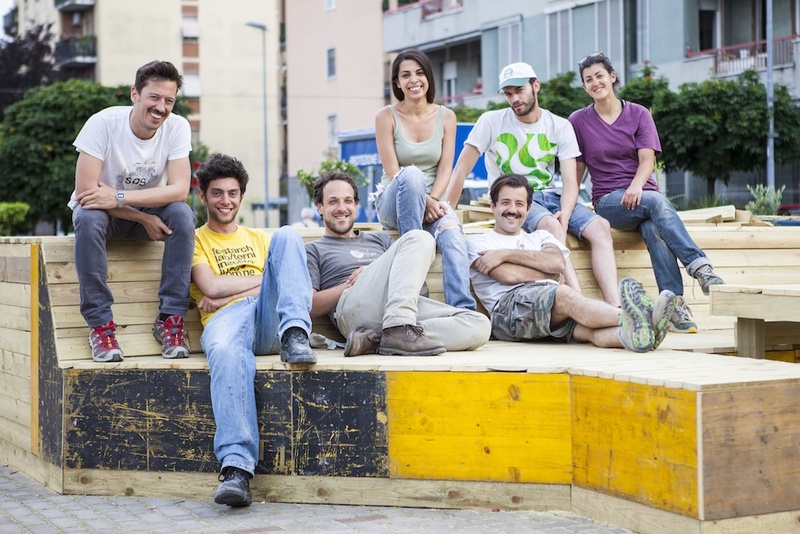 Jacopo Ammendola and Juan Lopez founded Orizzontale in 2010 with a group of other eight architecture students. In a few months, some students quitted the collective and some other joined it, until they reached the final team of seven people with Giuseppe Grant, Margherita Manfra, Nasrin Mohiti Asli, Roberto Pantaleoni and Stefano Ragazzo. There is no hierarchy in the team as they work together “horizontally” with none emerging from the group. Since their aim is to make the citizens conscious of the potentialities of common disused spaces, the local community is the main beneficiaries of Orizzontale’s initiatives. It’s possible to see some unofficial promoters of Orizzontale in the people in charge of the local dumps and of the local recycling cycle, who deliver to the architects the recyclable materials and findings that they use in all their public actions. The seven members of Orizzontale are all architects, they started their analyses in terms of new possibilities to use common spaces. Actually, they provide a service for the community, they use their competencies to fulfil the needs of the neighbourhood. For the first years, they’ve been provokers and providers of new social dynamics without but nowadays they use –maybe unconsciously- some of the key methods of service design as collaborative workshop and participatory practices of do-it-yourself architecture. People’s participation plays a fundamental role also after the installation of the projects, because the only way to make Orizzontale works is to let people freely use, take decisions and organize activities for the “hackered” spaces. This is how Orizzontale use architecture to design a new concept of public spaces, where everything is semi-permanent, not regulated by strict rules and ready to be flexible in responding to the different needs of the users.